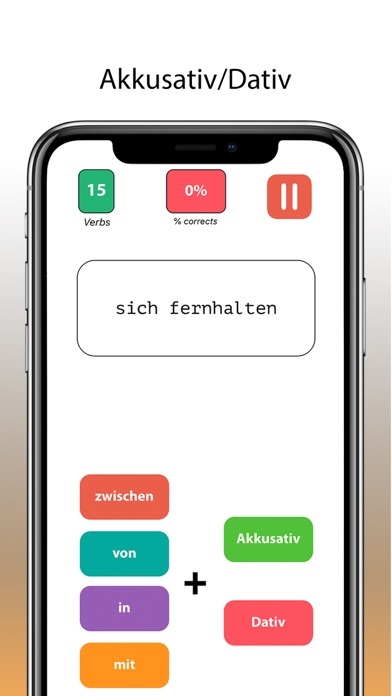 VerbPräp App Data & Review - Education - Apps Rankings! In German, some verbs are "married" with a preposition, and there are no specific rules to build this structure !. That is why these combinations must be learned by heart, which is always difficult. 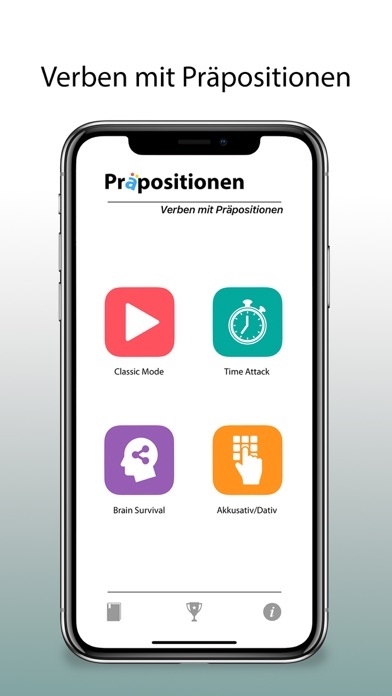 "Verben mit Präpositionen" will undoubtedly help you in this task. 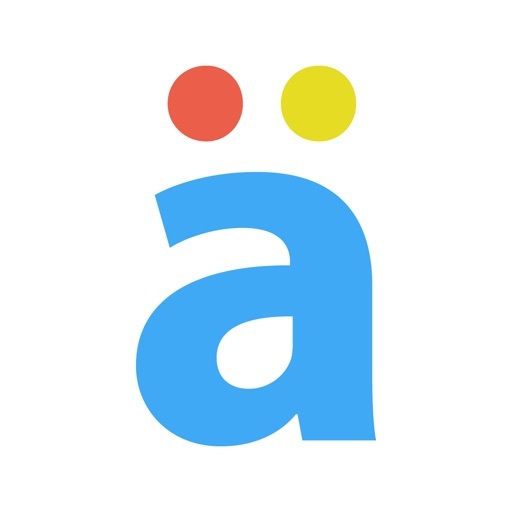 Do you naturally want to succeed in your German certification examinations from A1 to C1 level? Then "Verben mit Präpositionen" will contribute positively to your ultimate goal. Nine sentences will be presented in which you must properly place the corresponding preposition among four possible alternatives. 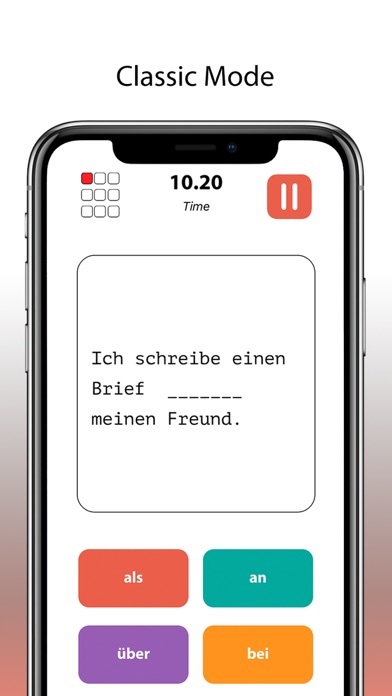 Solve the nine sentences in the shortest possible time !. For each incorrect answer, 5 seconds will be added and for a correct answer, 3 seconds will be subtracted. Quick! You have 90 seconds to answer as many correct sentences as possible. For each incorrect answer, 5 seconds will be subtracted and for each correct answer, 3 seconds will be added. You only have three unique chances to have mistakes. 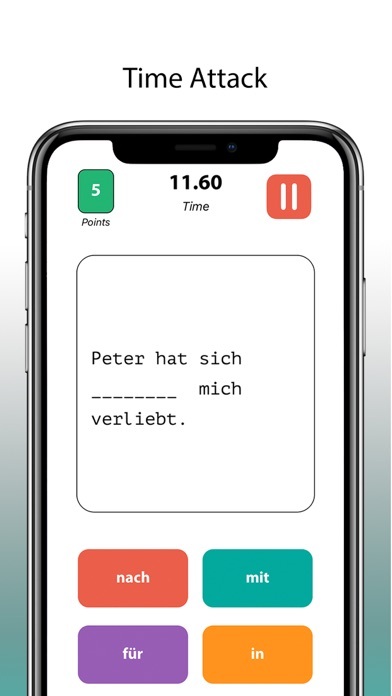 Solve the most phrases without losing the three lives. 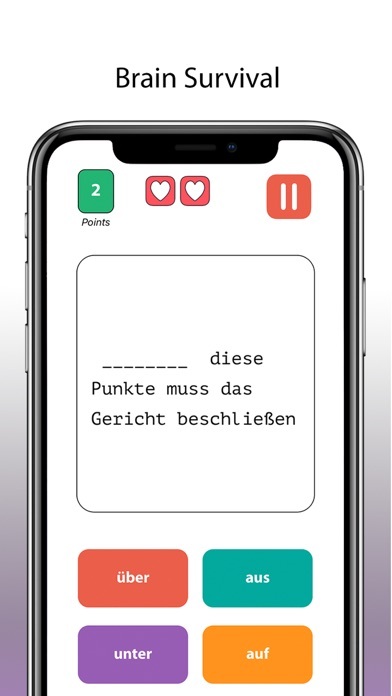 You must properly match the verb presented on the screen with its respective preposition and wisely select whether it is "Akkusativ or Dativ". You have 15 opportunities. 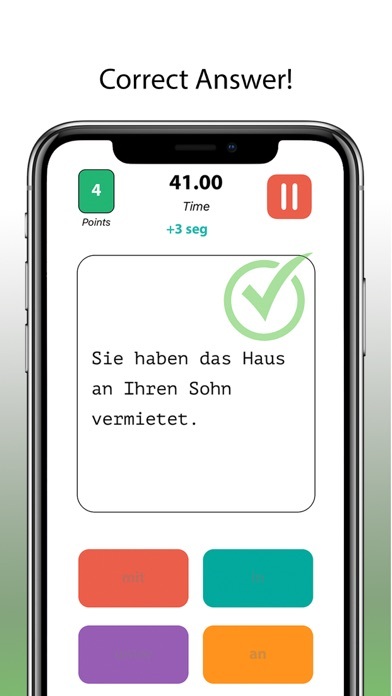 When you have reached at least five times in a row 100%, you can reasonably consider you have reached an important level in the German language. 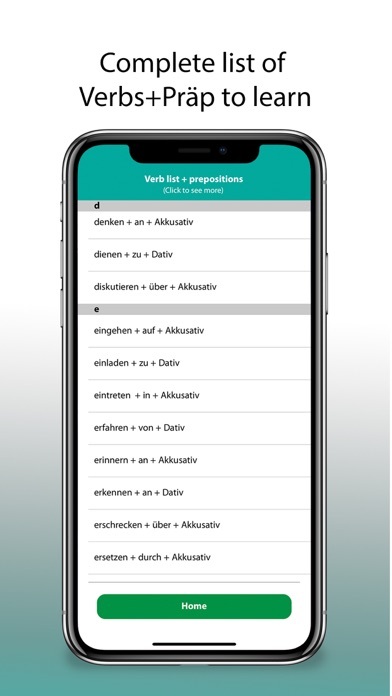 Additionally, the application typically has a comprehensive list of verbs and their respective combinations with the prepositions. We have so far about 200 verbs reviewed by language professionals, and the list continues growing. 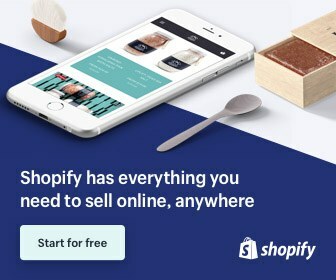 This list will be updated automatically, at no additional cost and without having to reinstall the application. 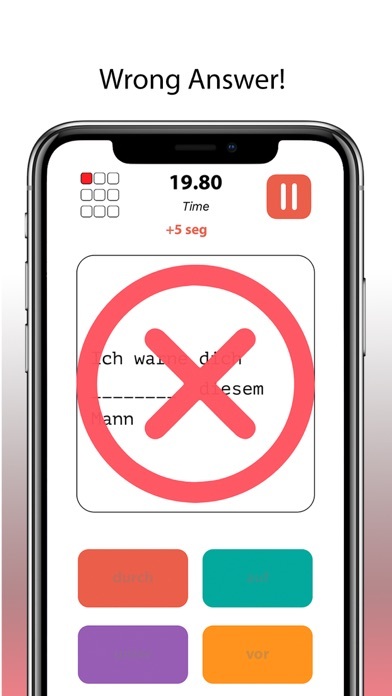 The applications VerbPräp was published in the category Education on 2019-02-09 and was developed by Dass System Solutions GmbH. The file size is 98.84 MB. The current version is 1.0 and works well on 11.0 and high ios versions. 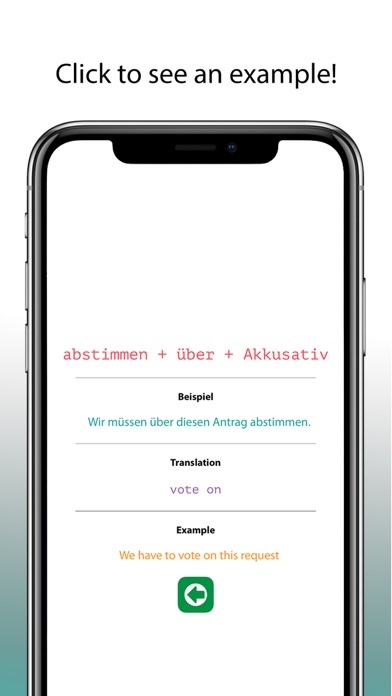 Do you like VerbPräp applications? Please share!